Jose Sarasola was congratulated by his friends Jake Cuenca and Jason Abalos about finding his new love interest. 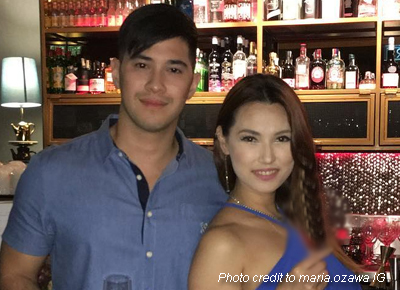 Japanese actress Maria Ozawa hasn’t only found a home in the Philippines, she also found love in the country. Chef/actor Jose Sarasola seems to be the lucky guy who caught the former adult star’s heart. Jose most recent post of himself and Maria received congratulatory comments from his friends and colleagues in the business including Jake Cuenca and Jason Abalos, which prompted netizens to think that they are already an item. Maria and Jose have been constant fixtures on each other’s Instagram accounts. But speculations of their romance made rounds after they were spotted spending time together last Valentine’s Day. The Japanese Internet sensation opted to live in the country mid last year after partnering with other businessmen to put up a gentleman’s club in a posh hotel in Pasay. Maria occasionally co-hosts with Mo Twister on his infamous podcast Good Times with Mo. Jose owns a sports bar in the south. He is best known for being a contestant in the reality game show Pinoy Fear Factor back in 2008.